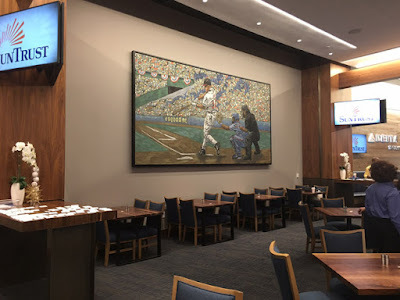 John Robertson's most recent commercial project is paintings for the new MLB Atlanta Braves stadium opening in April 2017 and the remodel of the NFL Green Bay Packers stadium opening in July 2017. He has created work for the Minnesota Vikings Football Stadium ( U.S. Bank Stadium ) in Minneapolis, Minnesota, opening summer of 2016. He also created five large-scale paintings for the new San Francisco 49ers, Levi Stadium. 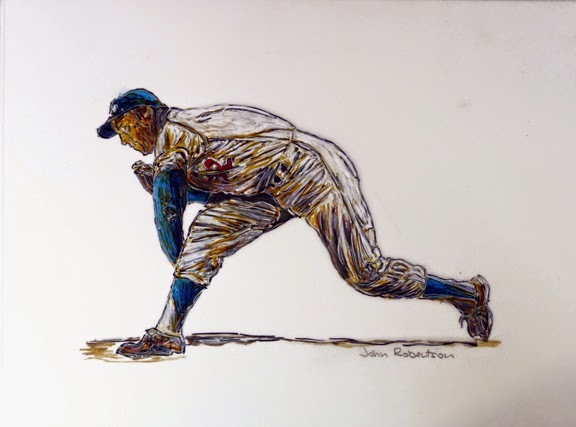 Sports Artist John Robertson has created art for Fox Sports, Fox Sports Net, Prudential Sports Arena (at the time home of the New Jersey Nets and the New Jersey Devils), the Amway Sports Arena, Orlando Florida home of the Orlando Magic and various other commercial projects. He has also created a number of images for private clients. t The Huntington Library, Art Collections, and Botanical Gardens. I have a dream tucked away in the shadows of my mind but I don't know exactly what it is yet. I'm hoping that one of these days the shadows will lift and the dream will emerge, like an Emerald City glowing in the distance. Meanwhile, it exists out there in the darkness, a land I've never visited in a world that doesn't exist. I've been thinking about this for two reasons. 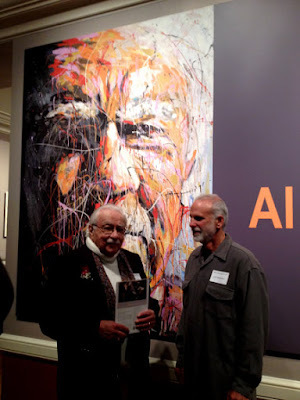 One has to do with ( sports artist ) John Robertson, whom I'll get to in a minute, and the other with a play at the Ahmanson called "TheFlight of the Lawnchair Man". It was in a trilogy of one-act plays about fate and goals and where life takes us. Sometimes whether we want to go there or not. In 'Flight," a childlike man named Jerry had always wanted to learn to fly, but his ambition had been thwarted for one reason or another. In middle age, knowing it is then or never, he attaches 400 helium-filled balloons to a lawn chair and drifts off into a fantasy-filled sky, feeling the sun, tasting the distance. When last seen, he was floating away in his dream. It was a lovely little play that I thought about a lot, because I'm a dreamer too. Most of us are, I think, but we never get around to living our dreams, except for one or two of us who tie balloons to lawn chairs and take to the sky. Which brings me back to John Robertson. Robertson is 57 and lives in a hilltop house trailer overlooking the ocean. He's a slight man with a graying beard and the kind of enthusiastic attitude that glows in the dark; a guy doing exactly what he should be doing. Robertson paints. Not with fancy oils and acrylics on textured canvas but with house paint on those rolls of canvas you put on the floor when you're redoing the ceiling. It was a question of economics at first. Drop cloths and cans of paint are a lot cheaper than the stuff you buy in art stores. Later it became a choice. He began painting about a dozen years ago in all kinds of styles and sizes, but what he's become known for are the faces of musicians and writers he puts on 4 1/2-by 6-foot canvases in a techniques vaguely reminiscent of Jackson Pollock's. 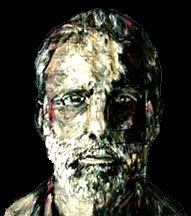 Faces glow through streaks and lines of color. Mine is one of them. Robertson heard I was going to read and sign my novel "The Last City Room" at Village Books in the Palisades and asked if he could paint my face to hang in the window. He took a photograph first and painted from that. The somber, meditative visage of a journalist stares out. Me in a darker mood. He was working as an executive for a large chain furniture store when he became ill. He took six months off then worked part-time for a year and a half. No one has ever figured out what was wrong with him. ...(until later when he was diagnosed with Aerial Fibrillation)... It caused emotional problems, he says, so he went to a psychiatrist who asked him what he'd liked to do as a child. Robertson said he'd always like coloring books. So the shrink said, "Then go color." A lot of things happened after that. He was fired from his job, his marriage fell apart and he went to see a Van Gogh painting at the Getty. It's called "The Irises,“ and it took his breath away. "I used to wonder why anyone would spend $50 million for a painting," he said. "Then I saw, 'Irises' and broke into tears. I stood there for two hours just staring at it. I've been trying to create the same emotional feeling ever since." forests and fields of flowers at first, pursuing the surge of emotion Van Gogh had engendered, like the lawn-chair man searching for something beyond his range of vision. But it was mostly the faces on large canvases that Robertson liked doing, seeking the elusive nature of those whose features he describes in streams of color. "Life is good," he said the other day. He meant it. Here was a guy who had walked away from a workaday world without looking back. Who discovered a talent he never knew he had, entwined with the dream he never knew he was dreaming. Here was a happy man. He sells enough paintings to pay the rent and buy food. It takes him about three days to do a large portrait, and he'll sell you one for what you earn in your own three days of work. Musicians and writers get them for a little less than, say Bill Gates might pay. "It's a bohemian life," Robertson says, "I only have time to paint. It's nothing great. I'm just putting paint on canvas. That's what it's all about. That's what I want." I stopped along the ocean on the way home to think about that, where sky and sea merge in a wash of gradient blues. I stared toward the horizon for a long time, wondering about my own dream. And as I drove away, I couldn't help but envy the lawn-chair man, colored balloons radiant in the sunlight, soaring off toward the far distance.